Princess Mary, the only daughter of the King and Queen, has written a short comedy script for the moving pictures. This has been produced privately, and exhibited at Buckingham Palace. Prince John posed for one of the characters. Princess Mary (later the Countess of Harewood) was then aged 16. The royal family were well aware of motion pictures and had been to see film shows (usually featuring themselves), and as early as October 1896 a privately-comissioned film had been made of Queen Victoria and guests at Balmoral, which survives (the guests included Tsar Nicholas and Tsarina Alexandra of Russia). But to be thinking of making their own dramatic film at such an early date is remarkable, not least for showing an awareness of the new popular entertainment that the commonfolk were flocking in their millions to see. Amateur dramatic films started to be relatively common in the 1920s, but 1913 is very early for such a production, whatever the strata of society. And then there is the one named cast member. 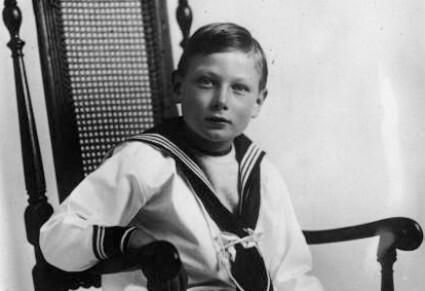 Prince John, the youngest son of King George V and Queen Mary, was a severe epileptic and was kept out of public view. There are photographs, but no motion pictures were ever taken of him – or at least that is what has been assumed. In 1913 he was was 8 years old – he would die in 1919, aged just 14. His story was poignantly told in 2003 in the Stephen Poliakoff television film The Lost Prince. The film showed us the boy viewing royal affairs with an innocent yet quizzical air, needing the love of his parents who instead hid him away on a farm, unable to express the emotions nature ought to have made them feel. Was Prince John filmed after all? It is not certain this report is correct, of course. It could be merely relaying a rumour. But assuming the film did exist, who made it? (if it was a professional he was discreet about it, because I’ve not come across any such report) – and what happened to it? There is a royal film collection, some of which has long been in the care of the BFI National Archive, but the films in the collection are not of so early a date – at least as far as I know. The film is most likely to be lost, not so much because the royals are likely to lose things (I don’t think they often do), but because surely it would have been uncovered by now. Or it may simply have decomposed. But someone ought to have a second look, just in case. Thank you! I’ve not been able to find a mention of the story in a British newspaper as yet (Times, Guardian, Daily Mirror) but that may be down to the limitations of word-searching digital archives. It’s The Cinema 23 July 1913, page 15. I wonder if there’s any record of this in the Royal Archives? At that time there were so many Royals throughout the world who got involved with cinema. Thanks for the reference, Stephen. I’ve never made an enquiry of the Royal Archives and don’t know how easy it is to do. Pehaps I’ll ask and find out.